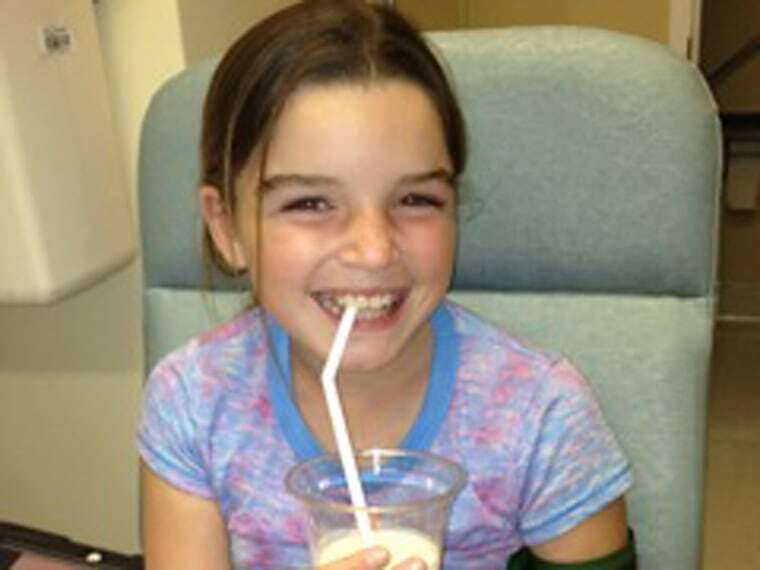 It’s been a harrowing journey for 10-year-old Tessa Grosso and her family. Tessa has multiple food allergies, and her severe reactions to even the slightest trace of certain substances could have killed her. But as chronicled in a recent New York Times Magazine story, Tessa took part in a clinical trial of a new approach for children with serious allergies to several different foods. The trial, led by Dr. Kari Nadeau at Stanford, involves desensitizing patients to up to five different allergens by very slowly increasing their intake over time. This was no easy task, for Tessa or her family. Nine months of preparations, including painful injections of the drug Xolair to protect her during her updosing and full days spent in the hospital testing her allergies led to more than a year of hospital visits where Nadeau's team would painstakingly increase Tessa's dosage by minute amounts, monitoring her closely at all times for life-threatening reactions. There were ups and downs along the way that at times were very scary. In other words, don't try this at home or with a doctor who is not part of an FDA-approved clinical trial. Her mother, Kim Yates Grosso, kept family and friends updated by email as Tessa progressed through the trial in 2012. This journal consists of edited excerpts of those emails. Last night at 6:00 she took her first dose at home ... She stares at the food for a long time before she works up the nerve to actually take it. When I gave her the cracker in the hospital it took her two minutes to take it out of my hand and then she just stared at it as she held it by the teeniest corner with her fingernails ... just as if one of us would if holding poison. February 13, 2012: I have realized a whole new level of stress as it is very hard to put Tessa to bed knowing that we have given her a dose of food she is severely allergic to. These were just the first of many sleepless nights of sleeping next to her or going in to check on her ten times in the middle of the night just to make sure she has not had a delayed reaction of some kind. But again ... ALL very much worth it and as most of you know I think sleep is completely overrated anyway! March 13, 2012: Dr. Nadeau has told Tessa she is now at a point where she does not have to worry about those “this product may contain traces” or “this product was processed on shared equipment” labels … What an amazing moment! Today I found myself having to ask where the bread aisle was in Safeway as I had never been there before! Then I looked like a complete weirdo taking pictures of breads and their labels. I am on a hunt for different products with wheat and barley in them (but no dairy, eggs or nuts) so Tessa can try new things. April 10, 2012: Tessa’s March 22nd updose … they started eliminating some of the flours and replacing them with real food ... We pulled peanut and milk powder and replaced them with peanuts and Hershey’s Kisses with a couple of M&M’s on the side for her “milk”! There were a few extra M&M’s on the side and Tessa asked me to eat them and I said, “No thank you” and she insisted that I eat them. It was the first time in nine years that I have ever eaten anything “unsafe” in front of Tessa. It was a very odd moment and a feeling that I just don’t think I will ever get used to. May 2, 2012: The great news is that she was taken up to 3,000 mg of each [allergen] and did so with no problem at all! The next step will be to food challenge Tessa up to 4,000 mg which will be a huge milestone. IF all goes well... Tessa’s current plan after the hospital on Friday is: cake from a bakery, then pizza and then ice cream! Update, March 14, 2013: Tessa successfully reached 4,000 mg which allowed our family to go out and celebrate with many firsts for Tessa and our family. Just in case all went well, I snuck in a REAL cake to surprise Tessa with in the hospital. We celebrated with a room packed with friends and family (the design on the cake drawn by my brother was of Tessa knocking down her allergens (dairy, wheat, eggs, peanut and almond). From there we continued the celebration and Tessa was able to eat pizza for the first time and go out for her first ice cream. It was an incredible day. We continue to monitor Tessa's doses daily as she needs to maintain 4,000-6,000 mg of each of the foods she was desensitized too. Might sound easy to some, but when you have been told for ten years that a food could kill you, it is not easy to force yourself to eat the foods. I have to get very creative in the ways that Tessa takes her doses. For example, she will not eat real eggs so we mix egg powder into anything we can think of. We still can not call this a cure as to this day her body will still react. She has airborne allergies as well as asthma and during pollen season, we have to be especially careful that she follows a strict regime to keep her immune system healthy. It has been an amazing journey… filled with so many firsts. This has been a gift, one that we are so grateful for. Tessa has become so much more independent and her anxiety slips away more and more each day. It is amazing to watch her just relax, enjoy life and just be a kid. It has not been easy and continues to be a challenge, and at times still can be very scary as there are still unknowns when you are the first. I am so proud of Tessa and all of these children that are giving their heart and souls to this research to make this world a safer place for themselves and other children.